Australian news morning show, Sunrise, interviewed a man who claims that he had worked with extraterrestrials on a US base in the 60s. 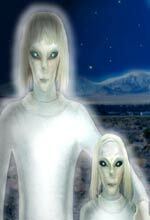 The ex-military man, Charles Hall, calls these beings “Tall Whites,” because of their appearance, and says the military had let them take up temporary residence near Nellis Air Force base in Nevada. He has written about his experiences in five volumes of a series he calls, Millennial Hospitality. Hall has been asked to do several talks and book signings throughout Australia in the month of April. Hall is a Vietnam veteran, and later served as a weather observer for the Air Force. It was in this position while stationed at Nellis Air Force base that he alleges to have met the aliens. He often had to spend a lot of time alone, and was able to wander the secretive air base. He says he found the alien base at one end of the Indian Springs valley, and was allowed to interact with them. Hall says he eventually also came into contact with the grey aliens that crashed at Roswell, and some human looking aliens with 24 teeth, he calls the Nordics. According to Hall, these interactions spanned the two year period he was stationed at the base.